Soak black beans for 8 hours, drain the soaking water. Fill the soup pot with fresh water covering the beans by 2 inches. 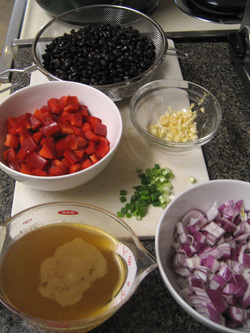 Cook the black beans until tender, maybe 1-2 hours. In a separate saucepan. Start by sauteing the onions, when soft add the carrots, celery, garlic, jalapeno and red bell pepper. Saute all veggies together until tender, maybe 5-10 minutes. When beans are cooked drain out half of the water that is left and add sauteed veggies, canned tomatoes and vegetable bouillon cube. Add spices and heat until warm. Add cilantro and salt to taste.